Is anyone else having a hard time believing that May is almost over? Gosh, was it busy. Not in a bad way, either. But in between writing, work, trips to Cape Cod, and life in general, I also worked on the online photo album of my Iceland trip that was one of the promised GoFundMe perks. (FYI: If you’re one of those donors, I hope to have the link ready within the next week or so. Sorry for the delay!) As a result, I’m on a social media hiatus (except for Goodreads) until the photo album is done, and then things should return to some sense of normalcy. So what kinds of things made me happy in between all of May’s busyness? Would it surprise you if some of those joys are lingering reminders of Iceland? 😉 And as always, feel free to share the things that made you happy this past month in your comments on this post. I’m starting this post with a confession: While I’ve managed to keep up with my own blog-writing, I’ve been so burnt out from the past month’s busyness that I’m struggling to keep up with reading other blogs or replying to comments. I’ve also been dealing with stress from (without going into too much detail) expected and unexpected sources. Some days were great, but others… Yeah. I hope this is temporary, though, since I still have one big event around the corner: My friend’s wedding (the one where I’m a bridesmaid) is this coming Saturday. Maybe once things calm down and I have some time to rest and regroup, I’ll feel some semblance of my normal self. But I just wanted to let readers know what’s going on, since you guys deserve my honesty. I love it when I find tea companies that impress me so much, I know I’ll be a paying customer in the future. Plum Deluxe has become one of those companies, and partly due to today’s sample. Check out my review of their scrumptious Self-Care Herbal Blend at A Bibliophile’s Reverie! Also, as I announced back in May, this is my final Time Time for ABR. Thanks again for reading and sharing these reviews, and for talking tea with me there for the past 2 years! Our final sample from Plum Deluxe is the Self-Care Blend, an herbal tisane that caught my eye for two reasons. First, how can you go wrong with a name like that for a tea? Everyone needs a reminder to slow down and take care of themselves, and tea serves as a good reminder of this. Second, this unique herbal blend features apricots and elderberries, two fruits that are known for their healing properties. It’s an intriguing combination – in fact, I don’t think I’ve ever seen apricots or elderberries paired together before, in tea or in food. So, I’m very curious how they’ll brew up together. It feels right to start off this month’s Time Flies with a big “thank-you” hug for everyone’s support recently. You were right: I didn’t need to worry about how downsizing my blogging schedule would affect things here. Plus, I feel more relaxed now that I’ve accepted my new time limitations and am focusing on quality and enjoyment instead of quantity and pace. This was the right choice, and I thank you all so much for encouraging me to do what was best for me. Speaking of change, I’ve altered the format of Time Flies this month. It’s not too different from what it was before, but you’ll see what I mean as this post goes on. So, let’s get to it! Our next two Tea Time samples come from Plum Deluxe. Since 2008, this Oregon-based tea vendor has been exploring all aspects of the phrase “Making Moments Matter.” From handcrafted organic tea blends and a Tea of the Month Club, to recipes and meditations and other gifts, Plum Deluxe is committed to reminding its customers to be well, mindful, and positive. I can’t say I’ve met another tea company with such an inspiring mission – not to mention the teas in their online shop look delectable! And what better way to introduce you to Plum Deluxe than with a bookish tea? 😉 Reading Nook blends a cream-flavored black tea with floral accents to create a soothing, stimulating, and truly unique brew. One look at the picture and description, and I knew I needed to review this beauty! During a recent trip to Maine, I visited Tea Maineia in Winterport, about 25 minutes south of Bangor. What a charming place! Not only does Tea Maineia carry a wide variety of teas (black, oolong, green, white, and herbal / rooibos), but it also sells teapots, mugs, and locally made condiments and other foods that pair well with tea. It also has a bright, welcoming environment inside, and the owner is friendly and wonderfully knowledgeable. If you’re ever in the Bangor area, I highly recommend checking out Tea Maineia! Looking for a more “dressed up” rooibos tisane? Lydia Had More Fun from Bingley’s Teas might be the choice for you then. It mixes red rooibos with freshly shaved coconut for a fun and indulgent herbal tea. Find out more about Lydia Had More Fun – and which Jane Austen character inspired this “dessert in a cup” – at my new tea review at A Bibliophile’s Reverie! Ah, Lydia Bennet. The youngest daughter of Pride and Prejudice’s central family, she adores fine clothes, fancy parties, and men in uniform. It’s no surprise that she’s one of literature’s most famous debutantes – or that she runs off with that shifty Mr. Wickham. Now, if there was a perfect tea match for Lydia’s naivety and self-indulgence, what would it be? The answer comes courtesy of Bingley’s Teas and their extensive Jane Austen Tea Series. Decaf seekers and dessert-tisane lovers, meet Lydia Had More Fun Rooibos Tea. Looking for this month’s Freelance Article Round-Up? It’s here – under a new name! Herbal teas are well-known for their medicinal, soothing qualities. 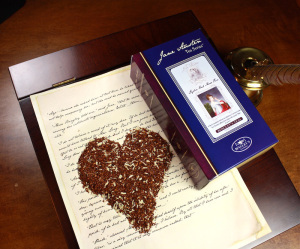 Compassion For Mrs. Bennet’s Nerves, part of the Jane Austen Tea Series by Bingley’s Teas, combines sweet, mellow chamomile with stimulating peppermint and other ingredients to offer a panacea to the excitable, melodramatic matriarch of Pride And Prejudice‘s Bennet family. The question is, does it do the trick? Find out by reading my review now at A Bibliophile’s Reverie!